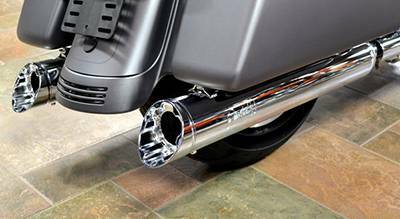 Fuel Moto is proud to introduce the Power Vision by Dynojet, a true evolution in tuning for all 2001-2016 Delphi equipped Harley Davidson’s. The Dynojet Power Vision is not only the fastest ECM flash tuner on the market, it offers the most powerful tuning features. 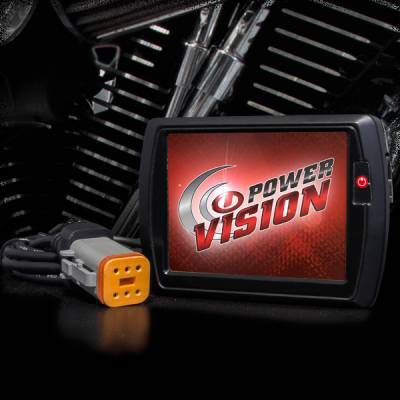 Power Vision features a fully configurable high resolution touch screen that can be either mounted on your bike and used to monitor real time data, or simply used for tuning, logging or storing maps. Power Vision also includes comprehensive tuning software for your computer including an integrated tuning utility called Auto Tune Basic which uses the stock narrowband sensors, and there is the awesome optional Auto Tune Pro kit which uses the AT-100 with dual Bosch Wideband sensors. Auto Tune Basic and Pro allow you to Auto Tune your bike right on the Power Vision display. 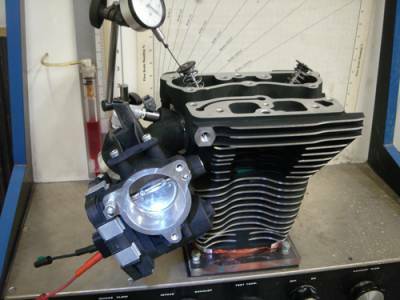 Fuel Moto will pre-program your Power Vision for your specfic modifications and we offer industry leading product and tuning support for our customers. We have more experience with Power Vision than anyone, anywhere, period. 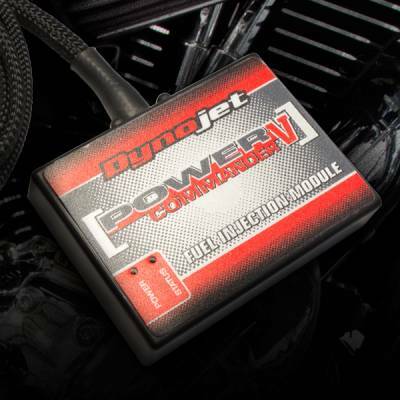 Fuel Moto offers 100% product support on the Dynojet Power Commander V. We have the worlds largest Power Commander map database offering calibrations for most popular combinations. For those of you with unique setups or are looking for live tuning the PC V will offers the optional Auto Tune module with wideband O2 sensor (dual sensors on V Twin models) which will allow you to tune in real time. We have extensively tested this product in many, many applications. Fuel Moto will pre-program your Power Commander for your specific setup based on the modifications you have done to your bike, we also provide legendary Fuel Moto service before and after the sale. 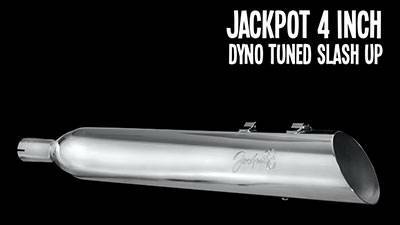 Fuel Moto USA is pleased to introduce the Fuel Moto Micro Tuner by Dynojet. This easy to install Power Commander V based controller features easy to use software and uses Dynojet PC-V maps. The Fuel Moto Micro Tuner features a powerful range of fuel adjustments, it allows for individual cylinder tuning including the decel area of the tune, a useful accellerator pump feature, and it will store three maps which can be be switched right on the Micro Tuner unit. There are also three broad range adjustment for making in field adjustments if desired. There are hundreds of maps available covering most popular applications. Fuel Moto will also pre-program your Micro Tuner based on the modifications you have made to your bike so it is ready to install when you receive it. There is also a wealth of support available from both Fuel Moto and Dynojet Research. FUEL MOTO is the #1 Power Commander dealer in the USA! Fuel Moto offers the best prices in the USA on Dynojet Power Commanders with unbeatable service. 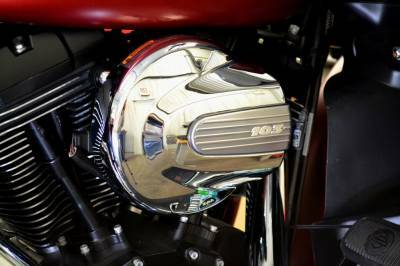 We have the largest dealer inventory of Power Commanders in the USA, when you order from Fuel Moto our Power Commanders are IN STOCK for immediate shipping. 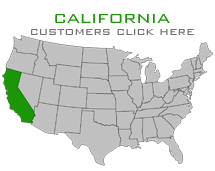 We are the EFI performance and Dyno tuning specialists and we will pre-program your Power Commander to your bikes specs from the USA's largest map database. Fuel Moto doubles the warranty on the Power Commander and also provides awesome in-house Dynojet certified tech support. Contact us now on what the Power Commander will do for your bike and individual set up. Fuel Moto is an authorized Zippers Thundermax dealer and dyno tuning center. 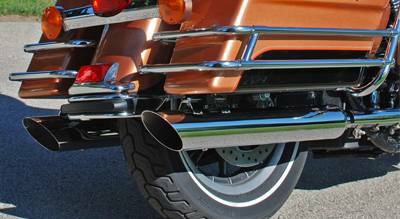 We offer the absolute latest Zippers Thundermax products with excellent Fuel Moto in house tech support. 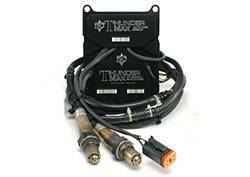 When you purchase a Thundermax Fuel Injection Module from Fuel Moto we will pre-program the Thundermax with the appropriate base map and base settings for your specific application based on the modifications you have done to your bike as well at your riding style requirements. The Thundermax module is a stand alone unit that completely replaces the stock ECM which means there is no wire cutting or splicing, just bolt it on and plug in the unit. The Auto Tune module can be configured within the Smartlink software to automatically adjust the EFI to defined target air/fuel ratios as you ride the motorcycle with wideband oxygen sensors to provide real-time feedback at all rpm's and load,for full-time AFR correction. The Thundermax Smartlink software allows adjustment of RPM Rev Limit, Idle Speed, Ignition Timing, best Target Air/Fuel Ratio as well as diagnostic codes and real-time engine data. The Thundermax is manufactured in the USA with quality components and carries a 3 year warranty. 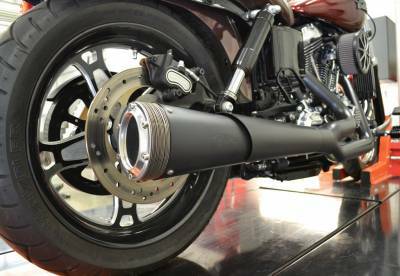 The Fuelpak FP3 is available Harley-Davidson models which use CAN Bus HDLAN ECM & J1850 ECM which includes 2007-2016 Touring, 2007-2016 Softail, 2007-2016 Dyna & 2007-2016 Sportster models. This unit connects wirelessly by Bluetooth to your iPhone or Android Smartphone. 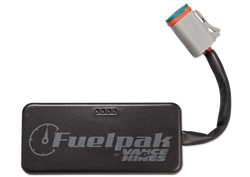 Fuelpak FP3 is a flashed based tuning product which has the ability to recalibrate various engine parameters and mapping for exhaust systems and other performance upgrades downloaded from the library of calibrations developed by Vance & Hines. Fuel Moto carries all of the latest Power Commander USB accessories at the best prices in the USA. We also provide technical support to ensure you get the right components and get them set up properly. 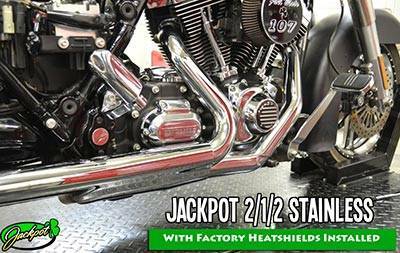 Introducing the Fuel Moto AC/DC Stage 1 Air Cleaner. This air cleaner is designed to work with the stock M8 OEM air cleaner cover or run open with the provided billet aluminum cover. As with all Fuel Moto parts, our kits include only the highest quality components. 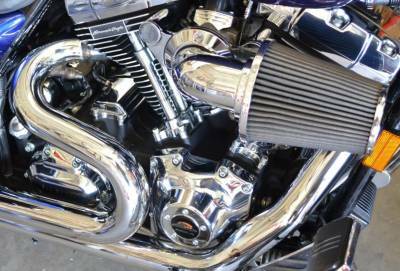 There are so many excellent performance parts available for your H-D that it can be difficult to bring together a set of components that truly compliment each other. 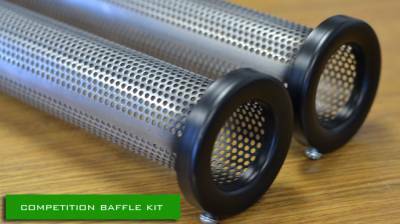 We have spent years testing and developing our big bore kits so you don't have to! Each kit has customizable features such as cam selection, piston selection, and some kits even include perfect fit pushrods tailored to your build. Our Fuel Moto 124" and 128" M8 bore kits are true bolt on combinations (no case boring required) and are sold as a complete kits with the absolute highest quality components, all of which have been extensively tested in house both on the dynamometer as well as in real world conditions to deliver top level performance. 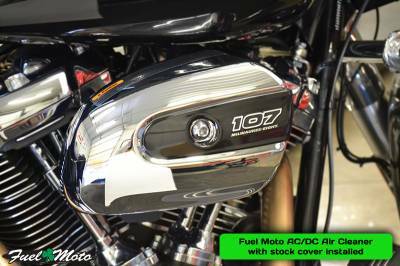 The 124" kit works on 2017-2019 H-D Milwaukee-Eight 107" engines (air cooled & twin cooled), and the FM 128 kit works on 2017-2019 114" and 117" engines. When combined with the appropriate performance modifications offers output in excess of 140+ horsepower; even more with head work. 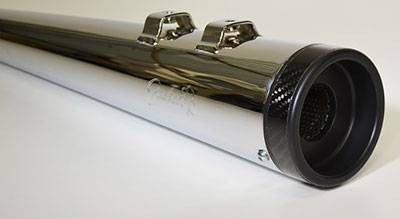 The Fuel Moto 110" Big Bore offers the biggest bolt on displacement available for H-D Twin Cam 96" and 103" motors, it features our 110 Extreme Duty Cylinders with special high tensile strength steel sleeves that drop on without case boring. This complete kit works on all 2007-Later Twin cam 96" and 103" motors, it delivers absolute top level performance and reliability and includes all necessary components required for installation. 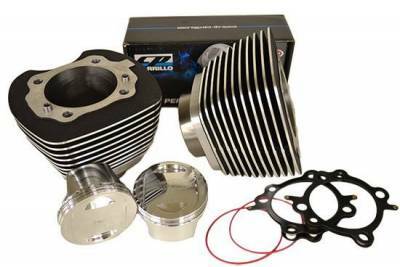 The Fuel Moto 107" Big Bore is a complete kit with the absolute highest quality components, all of which have been extensively tested in house both on the dyno as well as in real world conditions to deliver top level performance. This kit works on all 2007-2016 Twin cam 96" and 103" motors and delivers absolute top level performance and reliability. 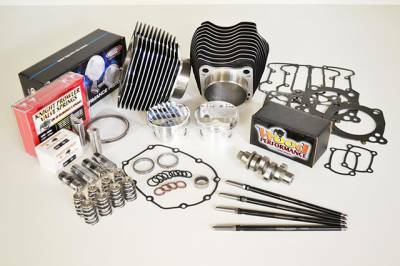 Our Fuel Moto 107" kit works with stock cylinder heads and valve train, or if you are looking for the next level of performance complement your build with our Fuel Moto Level B heads. 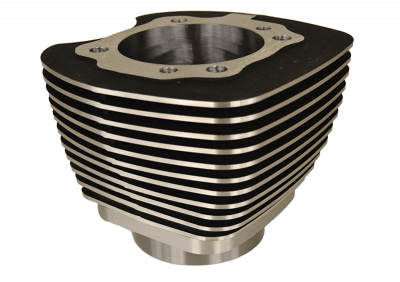 For those looking for big bore pistons & cylinders that are assembling their own combinations Fuel Moto offers a wide range of options for both Twin Cam and Milwaukee Eight engines. 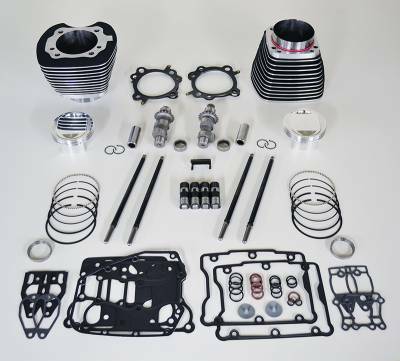 These piston & cylinder kits include the highest quality components, they include pistons, cylinders, MLS head gaskets and the appropriate base o-rings or gaskets. The Fuel Moto 98" Big Bore is a complete kit with the highest quality components all of which have been extensively tested in house both on the dyno as well as in real world conditions. 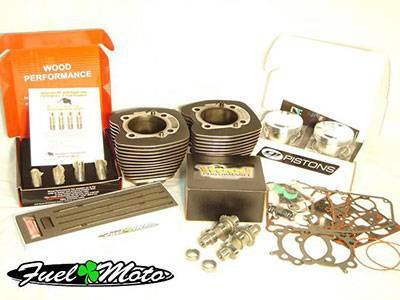 This kit is available for 99-06 Twin cam 88" motors and delivers absolute top level performance. 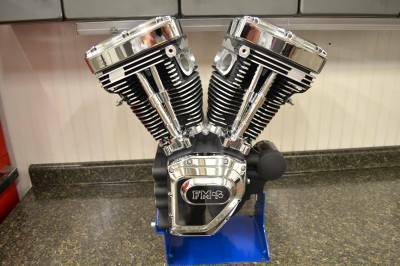 The Fuel Moto 124” Street Outlaw is a complete turn key Twin Cam engine for 2007-2016 FLH models designed to deliver top level horsepower & torque. These crate engines are built with top shelf components and include MSO (Manufacturer Certificate of Origin). 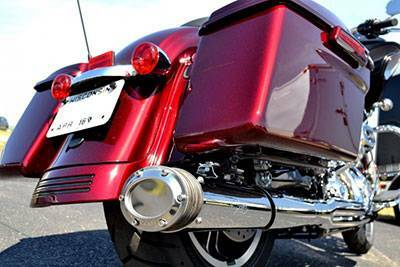 Ready to take your CVO 110" motor to the next level? The Fuel Moto 113" Big Bore is a complete kit built with industry leaders such as Wood Performance. Take things a step further and pair the 113" Big Bore package with Fuel Moto CNC CVO Heads for the ultimate performance and reliability. We have spent years performing R&D to find the ultimate combination of components to maximize performance while maintaining the reliability you have come to know and expect. The Fuel Moto 117" Big Bore is a complete kit with the absolutely highest quality components, all of which have been extensively tested in house both on the dyno as well as in real world conditions to deliver top level performance. This is a 130-140Hp pump gas package which requires case boring, true/balance/welded crankshaft, as well as other peripherals such as throttle body, injectors, exhaust, and appropriate EFI tuning device. We are also offering various options including gear drive cams & Timken conversion. Ready to take your SE 120R/ST motor to the next level? The Fuel Moto 124" big bore takes these popular Harley crate engines from mild to wild with NO case boring required! The Fuel Moto 124" big bore kit offers substantial horsepower gains along with huge torque gains. As with all Fuel Moto big bore kits, not only will you see increases in performance, but also with reliability. FLH Slip-Ons feature a triple stage core system that provides maximum flow and attenuation of sound waves to create an awesome deep, low frequency exhaust tone; further accentuated by our evolutionary tuneable elliptical diffuser disc system. 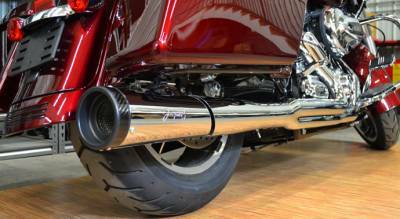 These mufflers make excellent horsepower and torque at an especially reasonable dB level making them especially suitable for touring. 2-into-1 full systems feature a triple stage core system that provides maximum flow and attenuation of sound waves to create an awesome deep, low frequency exhaust tone; further accentuated by our evolutionary tuneable elliptical diffuser disc system. The full system is designed make excellent horsepower and torque at an especially reasonable dB level making it especially suitable for touring and includes 15 E-Series discs. E-Series 2-into-1 full system fit 1999-2015 FLH models and have absolute top quality, show chrome plating or black ceramic finishes available. The E-Series 2/1 full system is designed to make superior horsepower and torque at an especially reasonable dB level. These systems have been tested extensively on the dynamometer as well as in real world conditions for optimum performance. Each 2/1 full system features a baffle system which provides maximum flow and attenuation of sound waves to create an awesome deep, low frequency exhaust note which is further accentuated by our evolutionary tuneable elliptical diffuser disc system. 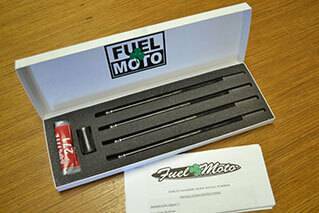 Fuel Moto Quick Install pushrods are the finest available. They feature a .095 Chromoly tapered design that is engineered for maximum strength and durability and allows users to easily swap cams without removing the fuel tank or disassembling the top end. They are designed for use with the stock pushrod tubes and include our unique pushrod tube tool which holds the tubes in place for easy adjustment. These pushrods fit 1999-2016 Twin cam models. 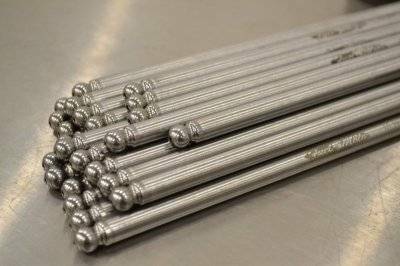 Fuel Moto pushrods feature a lifetime warranty. 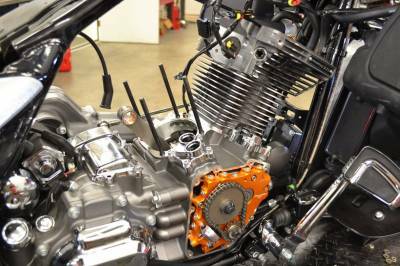 Fuel Moto offers comprehensive in-house cylinder head services for late model Harley Twin cam engines. With nearly 20 years of porting experience in a wide range of applications we can provide a cylinder head package for nearly any combination using our proven programs that have been developed on the flow bench, the dyno, and in real world testing for maximum performance and drive-ability. We use only the absolute finest parts and components from manufacturers such as Wood Performance, AV&V and all of our R&D is done in-house. Fuel Moto is equipped with a Superflow flow bench with data acquisition capabilities, a well equipped machine shop, and all design and development is tested and verified on our Dynojet 250i chassis dyno. 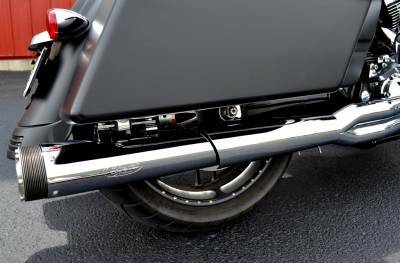 Fuel Moto carries Wood Performance Knight Prowler cams for Harley Davidson models. 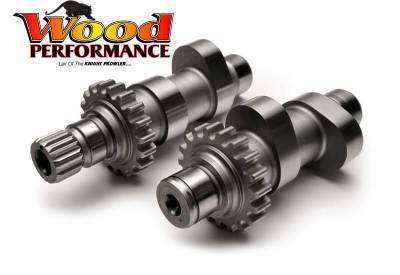 Wood Cams are designed by Bob Wood of NHRA Funny Car fame and are custom manufactured by Andrews Products to exact Wood Performance specifications. Knight Prowler cams feature short duration, high-lift specs that are a trade mark of Bob Wood that yield excellent torque and horsepower gains, not matched by other cams. 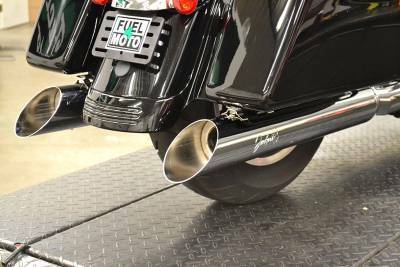 Fuel Moto is the Midwest's premier official Dynojet tuning center facility. Featuring a state of the art dyno cell equipped with a Dynojet 250i load control dynamometer we can perform a wide range of highly accurate tests including horsepower and torque, as well as exact air/fuel ratio. 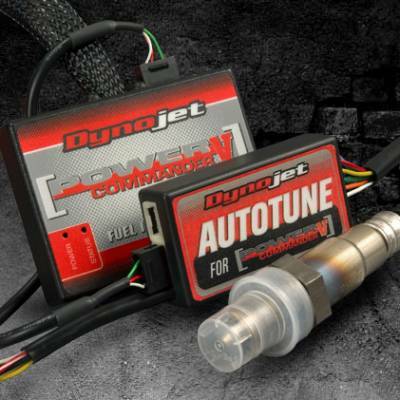 For tuning, our dyno is equipped with latest software including Dynojet Tuning Link as well as advanced tuning software from many other current EFI tuning manufacturers. 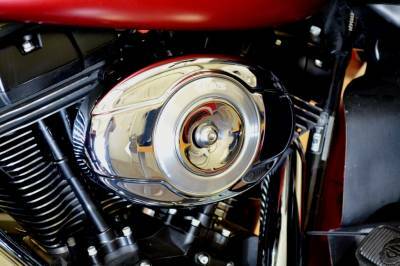 Fuel Moto offers throttle body porting for 2008-2015 Harley Touring throttle by wire induction modules. This service includes cleanup and porting of the runner and manifold, contouring the transition around the injector ports, and matching the inlet radius to the air cleaner backing plate. Throttle body remains 50mm. 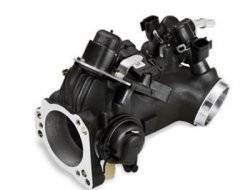 We offer a 1 week turnaround on customer supplied throttle bodies. Fuel Moto pushrods are the finest available and feature a .095" chromoly tapered design that is engineered for maximum strength and durability. Both quick install and perfect fit pushrod styles are designed for use with the stock pushrod tube covers. Available for the 107 & 110" big bore kits, these extreme heavy duty cylinders offer a much thicker liner and fins which provides the best possible thermal heat dissipation. We have partnered with an industry leader in EFI Tuning, Dynojet, to bring you custom EFI tuners at budget friendly prices. 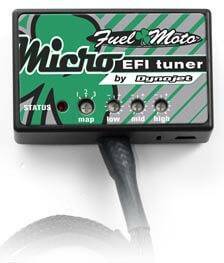 Fuel Moto USA is pleased to introduce the Fuel Moto Micro Tuner by Dynojet. This easy to install Power Commander V based controller features easy to use software and uses Dynojet PC-V maps. 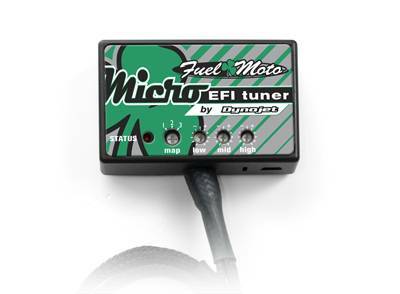 The Fuel Moto Micro Tuner features a powerful range of fuel adjustments, it allows for individual cylinder tuning including the decel area of the tune, a useful accelerator pump feature, and it will store three maps which can be be switched right on the Micro Tuner unit. There are also three broad range adjustment for making in field adjustments if desired. There are hundreds of maps available covering most popular applications. Fuel Moto will also pre-program your Micro Tuner based on the modifications you have made to your bike so it is ready to install when you receive it. There is also a wealth of support available from both Fuel Moto and Dynojet Research.